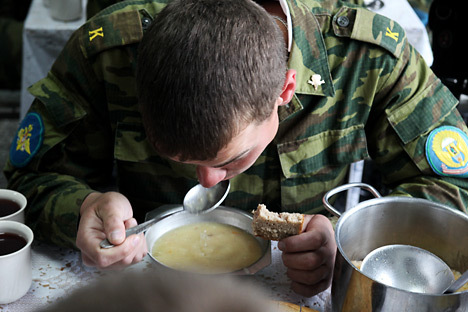 For thin, young men in the Voronezh Region, the first month of military service is somewhat unusual. Here, recruits who weigh in below the army’s standard weight are sent to a kind of health center where they can fatten up. The Dzerzhinskiy health center keeps itself on a strict routine. The recruits have five high-calorie meals a day, a nap after lunch, a swimming session, massages and oxygen cocktails. More than 150 young men eligible for military recruitment have been brought here from all over the Voronezh Region. The potential recruits range in age from 18 to 26. Some of them have just graduated from high school, some are students, while others have already graduated from some institute of higher education. After breakfast it’s time to weigh in. The young men form an orderly line and their weights are recorded in a special ledger. Nikolai Ivanovich takes a long look at the figures, and then rubs his hands in satisfaction: “Nearly everyone has put on weight! Give it another a month and we can let them go.” For their part, many of the new recruits wouldn’t mind staying longer. At first no one was very excited by the prospect of going to the health center. Some even hoped that being underweight would disqualify them from having to do military service at all. But the military recruitment offices urged the skinny guys to sign on for a month at the health center, telling them that it would be a time of relaxation that would count as part of their military service, and adding that they could always leave if they didn’t like it. But as it happens, most of them do like it. It’s kind of like camp. The recruits play pranks like writing on each other in toothpaste at night, and they often went to a small shop down the road to buy cigarettes and beer – until Nikolai Ivanovich issued the shop owner a strict order not to sell beer to the recruits. The officers have started going on patrol at night, employing their own special surveillance tactics to establish what is going on. “I count the number of legs I see and divide this figure by two; this tells me how many of them there are,” said Vladimir Buzdin, commander of the fifth platoon, and a veteran of the Afghan war. Like most of his fellow inmates, Vanya Kozhin can’t put a finger on why he was thin when living at home, and has now started to put on weight – from 123 lbs to 132. Vasya Kolesnikov blames the fact that he spent so much time in front of a computer: “I sat there practically dead to the world and my mom couldn’t call me to the table.” Nikita Popov thinks he was studying too hard: “When I was at college my entire daily food intake consisted of one hamburger. And I just drank tea in the morning.” Parents have their own theories – many mothers complain that their sons only ate fast food when they were small, as they refused to eat anything else, and when they grew up, they lived off soup and potatoes. The full text of this article was published in Ogonyok magazine.